Note…this post may contain affiliate links. I decided to try my hand at natural dyed Easter eggs this year. I pulled food and spices out of the cabinet and fridge and got busy trying different things to see what works and what doesn’t. 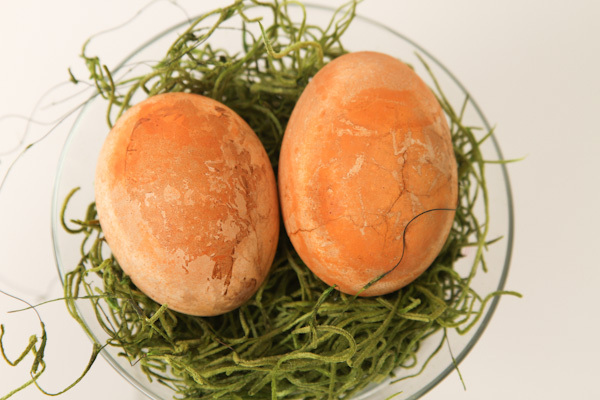 I remember my mom and grandma making natural dyed Easter eggs with red onion skins when I was child, but I don’t remember how they dyed the eggs using them. 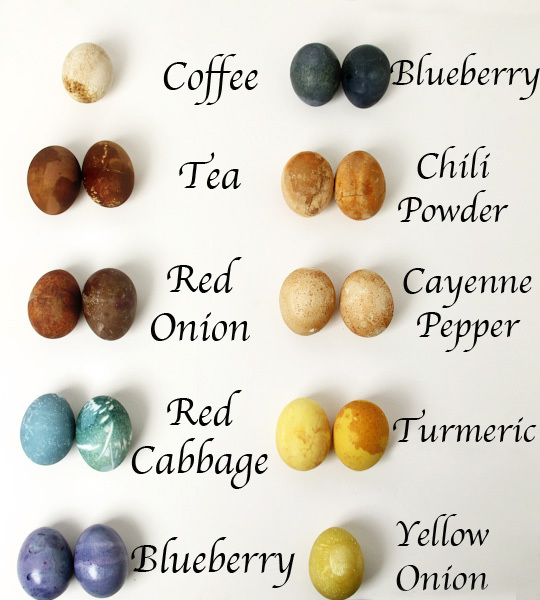 A little research and I had an idea of how to go about dyeing the eggs using natural ingredients. Alan is quite the trooper. He came home and saw my little experiment going on in the kitchen and just took it in stride. These bowls took up about 75% of my counter space so nothing else would be happening in the kitchen (ie: cooking dinner) until the experiment was over. The items that you see at the far left of the image are some of the ingredients for my super tonic that I’ll be sharing with you soon. I left the eggs in the solution for 2.5 hours, 5 hours, and 9 hours just to see what kind of colors occurred over long periods. At 2.5 hours some of the eggs could have been considered done, but I wanted to see the results from leaving them in longer. At five hours the red cabbage eggs are turning a beautiful color blue. Nine hours was too long. I could have been done at 2.5, perhaps sooner, for most of the eggs and 5 hours for the turmeric and red cabbage. Some of the eggs could have come out of the solution right away and some others needed at least the full 5 hours. I’m sharing the “how to” for each egg below. Here are the eggs after 9 hours in the liquid and air drying. The only exception is the two different blueberry eggs in the chart. 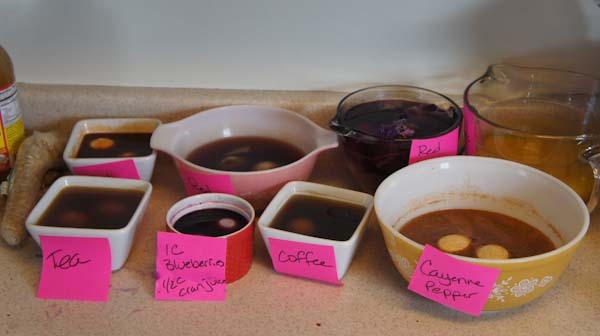 The one in the upper right corner is blueberry and cranberry juice after nine hours and the eggs in the lower left is eggs just rolled in blueberry juice and removed immediately. The yellow onion was also only left in for a couple hours. 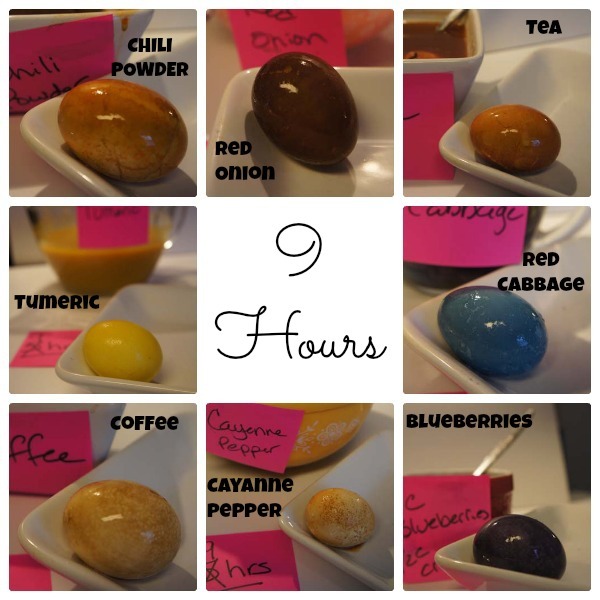 I completed two sets of eggs the next day so didn’t include them in the 9 hour experiment. 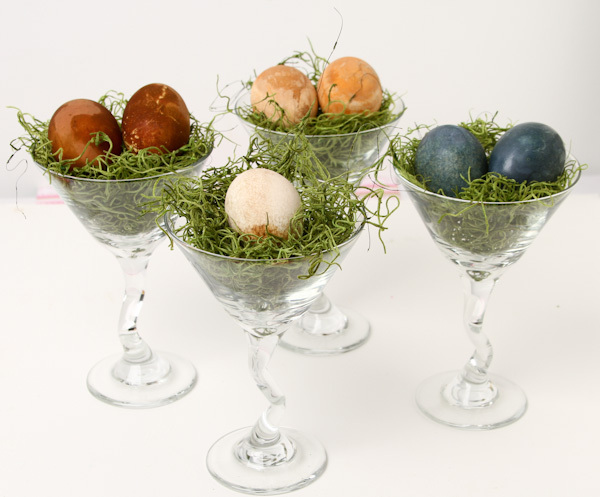 I displayed the eggs in these awesome martini glasses and LOVED how they looked. I just added a bit of spanish moss to nestle them on. BLUEBERRIES: 1/2 cup frozen blueberries (thawed & smashed) + 2 Tablespoons white vinegar (cold method). Roll eggs until color is achieved and then remove. These took just a couple minutes to make. BLUEBERRY/CRANBERRY JUICE: 1 cup frozen blueberries, thawed and smashed, 1/2 cup 100% cranberry juice + 1/8 cup white vinegar (cold method). I’m not sure how much impact the cranberry juice had on the color but I needed some liquid for the eggs to sit in and I didn’t want to dilute it with water so I used some cranberry juice. 9 hours was too long, in my opinion, for these eggs. I thought they were perfect around 2.5 hours for a light spring color. CHILI POWDER: 2 cups warm water + 3 tablespoons chili powder + 1/8 cup white vinegar (cold method). Eh, wouldn’t make these again. The color reminded me a lot of brown eggs. 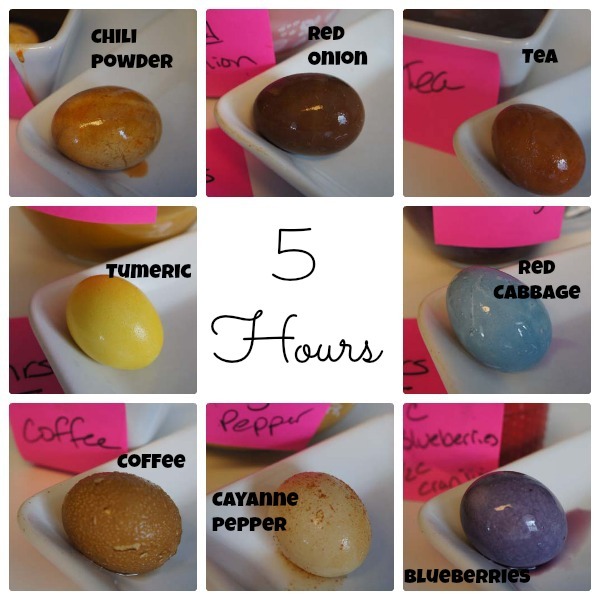 Have you tried dyeing eggs using natural ingredients? What have you used? How neat! I love the earthy tones! Beets make a good coloring for a nice purple color. 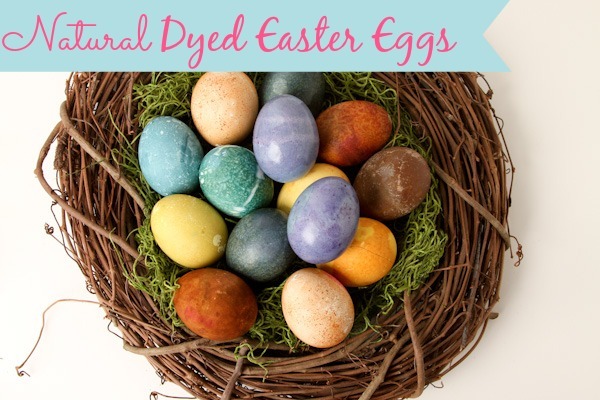 I have always wanted to try natural egg dying, this post is awesome! Thank you for the detailed instructions! Your eggs are beautiful! I love the red cabbage ones! Have you tried beets for pink?? Great experiment. I found the entire article and pics to be really interesting. Might have to do some experimenting myself! Did the colors last and stay bright? How long did they last? I absolutely LOVE how these turned out, they look gorgeous. My kids look forward to the pastel colors of pinks, lavenders, greens, and such for Easter. Is there any ingredients that you know of that could produce more of those tones naturally? I love the idea, I’m just not personally drawn to the earth tones as an Easter thing. They are still in my fridge and still look great. I’ve read that you can wipe them with oil to give them a shine so they are brighter. I wanted to try using leaves or petals, but I had nothing in the house and didn’t feel like making a trip to the store. I wish it was Spring here so I could just go pick some flowers. Sadly, there is still a lot of snow on the ground. Emptying the shells is a great idea. We’ve blown out eggs in the past. Time consuming but worth it. Jen, If you don’t leave them in as long they come out more towards the pastel end. Blueberries, beets, rad cabbage, yellow onion peels should all give a nice pastel color. I’ve also been told you can use kool aid to dye them, but haven’t tried that yet. Just another recommendation for beets, you can use red for shades of pink, red, or deep purple. You can use golden beets for a nice yellow. These are spectacular! Thanks so much for sharing! I have done many of these with no vinegar. Onions and others I have just added while the eggs are boiling also. These earth tones are lovely….I will be trying them. Thanks for the ideas to experiment with everything. So -these are beautiful. You said some of the eggs took on the flavor of the thing used to dye it? Which ones, and did they *all* do that, or only the ones you left for the longer time? From other instructions that I’ve read individuals noted that the eggs could take on the flavor. I havent tried any of the yet to know which ones that might happen with. My guess is that the spices would absorb through and could flavor the eggs. Thanks! I’ll have to grab some beets at the store and give that a try. Beets are great for a fuchsia pink or purple like color, also chlorophyll drops make a vibrant green color! You can get chlorophyll drops at any natural foods store. Thanks so much for this experiment, it helps immensely! 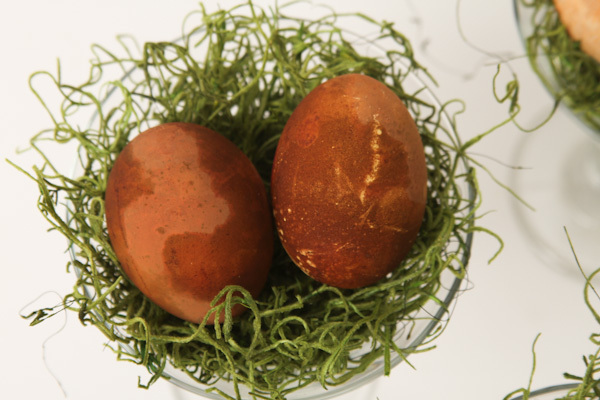 If you crack the eggshells delicately and then put them in the dye, the flesh of the egg white will take on a lovely marbelized effect. It would, of course, impart a flavor as well but that occurs anyway, per your blog. I know someone said to use Chlorophyll drops to make green, but has anyone tried mixing colors? Like Tumeric and Blueberries or something? I haven’t tried mixing colors, but its a great idea. *Saftey Note* Do not eat hard boiled eggs that have been left out for more than 2 hours. 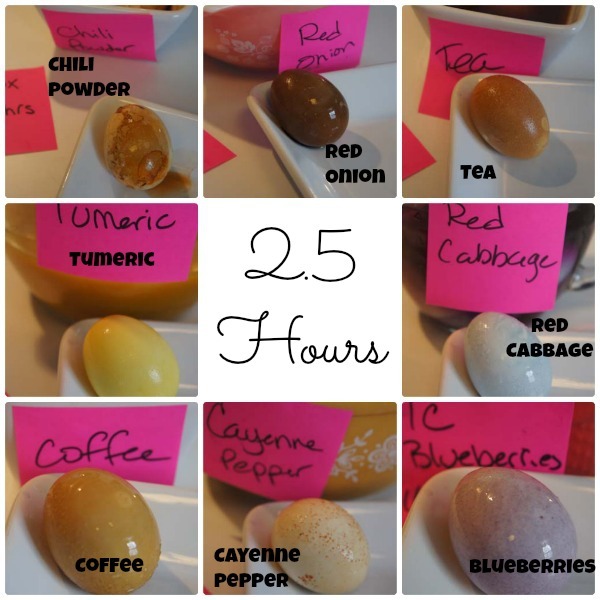 Refrigerate hard boiled eggs within 2 hours 45degrees or less, eat within 1 week! Raw eggs can only be left out for 2 hours or less also. We don’t want people out there getting sick. Some other natural colors can be obtained from Aracauna chickens – I get pink, green, khaki, and blue from my Aracauna hens. You can also get pink from cabbage leaves if you don’t use vinegar. Thanks for posting this, I’m going to share it with some friends. I did this last year with blown eggs (we have an omelet every Sunday and I blow a few eggs each week and save them up for this). Some of the eggs seemed to burn on the bottom of the pan with the hot method. All of the shells became extremely soft and fragile, presumably from the vinegar. They also became moldy after a few days. Additionally, I had tried to get a resist on the eggs by holding some leaves to the eggs and securing them in bits of nylon stocking (as seen in Country Life magazine) but the leaves slipped around and the resist didn’t turn in to much…. Will try again this year! Are you eating these are just doing them for decoration only? I think it should be noted that hard boiled eggs left out more than two hours are not safe to eat. That’s what I said Jane. I was shocked to see how long she soaked them on the counter. However they are beautiful, just inedible. I’ve used saffron for a beautiful yellow, but the color fades fairly quickly. Walnut hulls (the part on the outside of the shell) will give a nice, deep chocolate brown. Sandalwood and henna give a lighter brown and a rust color. Madder root, if you have some, will give a lovely orangey-red. 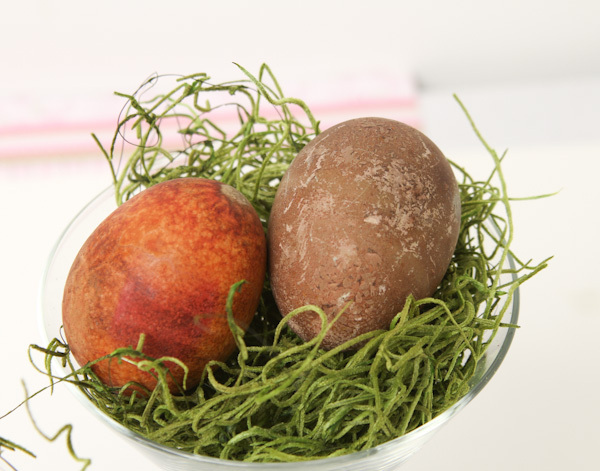 Do not boil madder root dye – you will end up with a reddish-brown color (unless you want a reddish-brown color). I’m going to try annato, which you can get in many spice aisles. It’s used as a yellow-orange coloring in many foods, like cheese. Red beets could be used also. It’s not actually true that eggs left out more than 2 hours are unsafe. If they are still in the shell. 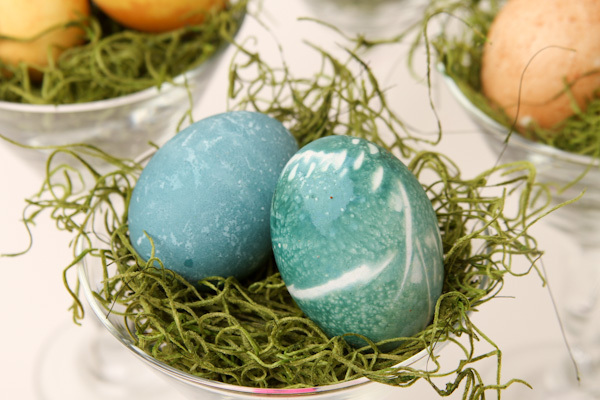 Out of the shell is a different story, but you can easily go a couple of days safely with hard boiled eggs that haven’t been cracked..
As a child, the “Easter Bunny” hid the eggs we had colored for us to find. After finding them, my mother always put them in a bowl on the kitchen table where they stayed until they were eaten. That was probably days, but I don’t remember anyone getting sick. Hi Cara–Great ideas! I actually have to look up Madder root, not sure what it is, but I love the idea of an orangey-red color. Same with Annato. Thanks so much for sharing! Hi Charity–Thanks for noting. I’ll add to the post. I know there is some conflict on if its safe or not, but always better to err on the side of caution. As a note, these eggs were made just for the post. However, as a compromise I’m sure the eggs could sit in the colored water in the fridge, making them safe to consume later. 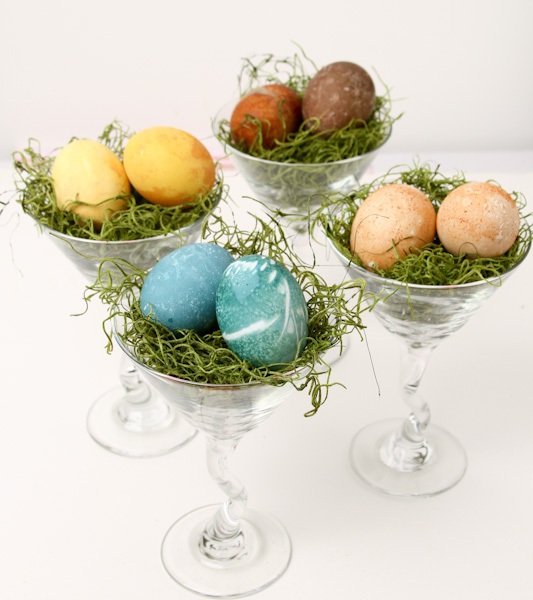 Hi Annie-I emptied shells last year for my silk tie dyed eggs. (http://justshortofcrazy.com/2010/03/silk-tie-dyed-eggs/) It was challenging, but fun. Hi Phyllis. Your comment makes me want to have chickens again just so we can have pretty eggs. Will try cabbage without vinegar for a pink effect. Thanks for sharing. Hi Lissa, Good thinking about blowing out the eggs each week and saving the shells (I’m having one of those “why didn’t I think of that” moments!) My eggs have been in the fridge and haven’t turned moldy, however, I’m in northern Michigan and its still really cold here so climate might help. I’ve read about using a nylon stocking before but have tried it. I’ll let you know if I find a good solution. Thanks for the concern. These were made strictly for this post. It was an experiment to see what would happen. Next time I’ll try leaving them in the solution in the fridge and see if the results are similar. Spinach and saffron is a great idea. Saffron is expensive here, but maybe I can find an online source that is more cost friendly. Thanks for sharing. did you start with white eggs? I wonder how well brown eggs would take the dye? and cloth/sock held together with a rubberband. Then i cook them in a steamer which makes the colours look very dark and impressions are very distinct. 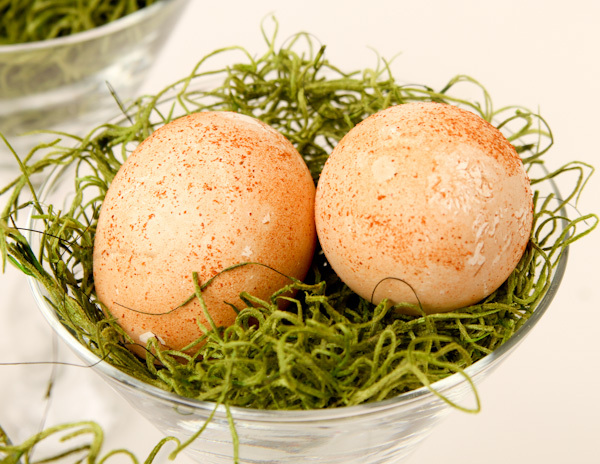 Do this without the vinegar, but after boiling eggs, crack the shells, then dye. 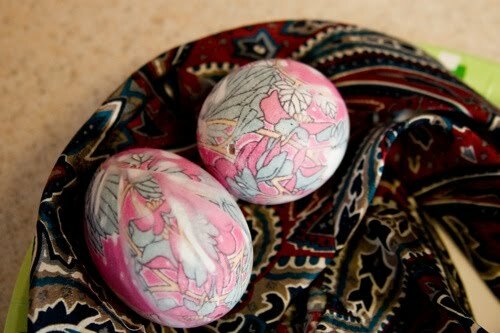 When you take the eggs out of the shells, they are beautifully marbled and crackled. Julie, I used white eggs. I’m not sure what colors would occur using brown eggs. If you try it let us know what happens. Thanks for stopping by. 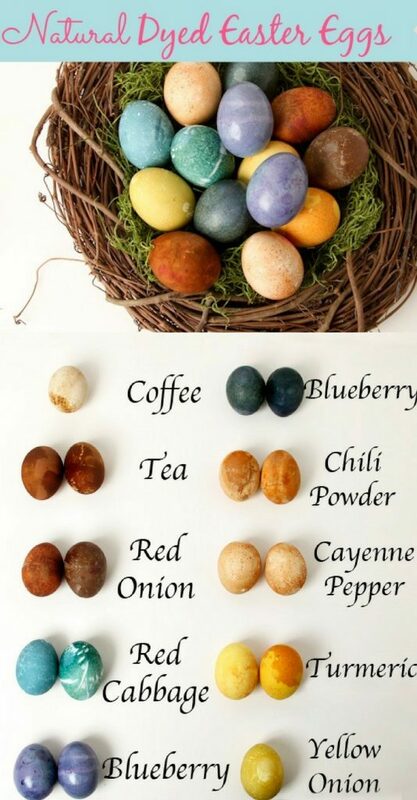 Hi Grace, I going to try this method next time I make colored eggs. Thanks for sharing. Kathy, I bet they look great with this method. Adding to the list of ways to color eggs. Thanks for sharing. I am surprised that you didn’t use a beet which gives off beautiful color. So do cherries. Thanks for your post! Deb, If you want an easier way to blow out eggs, I have used two egg blowing tools with great results: a Blas-Fix egg blower and a One-Hole egg blower. Both are available from the Ukrainian Gift Shop at http://www.ukrainiangiftshop.com/EGG-BLOWERS/products/36/. Also, one of my friends used to use a syringe to get the insides out of eggs (well, she was a paramedic/RN). It worked well for her, but I haven’t tried it. I am so excited to try these and my own egg ideas! Thank you! I am looking forward to Easter now! 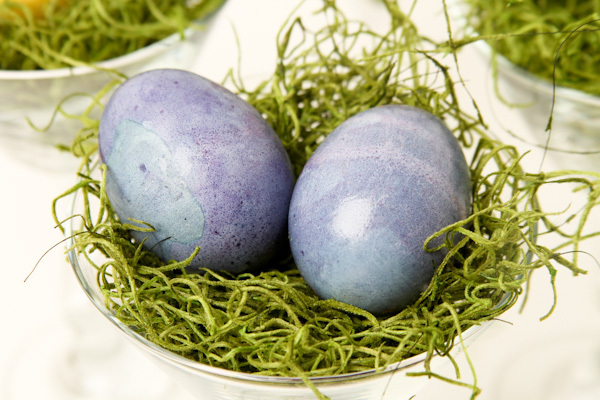 Pretty, but I’d much rather eat my blueberries and cabbage than dye eggs with them. 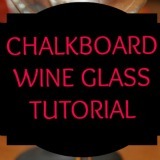 But a good idea for those who don’t want to use food coloring. These are beautiful Deb. 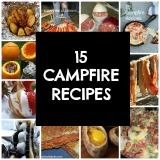 I especially like the blueberry/cranberry juice ones. I too as a kid ate eggs that were out att day. But we have learned much since then. I actually didn’t know much about food safety until recent years, and boy am I glad that I did. I had a few bouts with food poisoning and tons of upset tummies. I no longer have that. Scientists have shown that bacteria can form in the white and especially the yolk, insidw the hen before the hard shell is formed. Hence the reason for the 2 hour rule. I pulled this info from the egg safety site. If you think about it the inside of the egg is the flesh. Even a steak sealed out on the counter all day will grow bacteria. It’s better to be safe than sorry. Thanks for posting Deb. I appreciate you responding to me.sorry for the typos. Thank you sooo much for sharing! I can’t wait to try some! Put me in the spirit of the holiday for the first time in years! I wondered about the flavoring, then saw your comment. Should add interest! Cathy, I know. I didn’t have any beets in the house and I dread going to the grocery store so I just skipped it. Never thought about cherries. Going to add those to my list as well. Thanks for sharing. Thanks for stopping by and sharing your insight. It’s great getting feedback from my readers. I’m sorry but eggs keep far better and longer than some of you give them credit for. As children eggs set out, dyed, hidden,found, put in a basket, eaten and we survived. I boil eggs and leave them to cool while I go out. If anything, the acid and spice probably keep safely longer. You can wrap eggs in onion skins much like you did with the cabbage and get very fun mottled patterns. 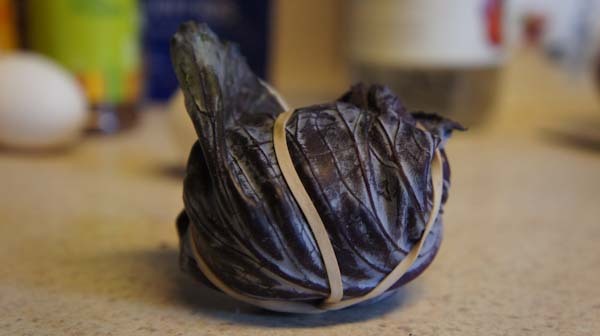 I have also wrapped pretty leaves inside the onion skin (e.g. 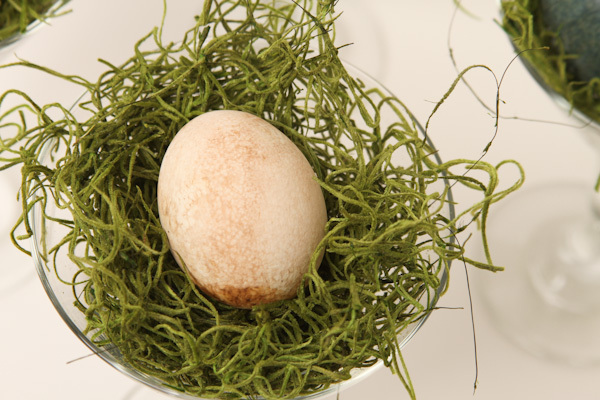 ferns) and boiled, to get a leaf pattern on the egg. rhubarb, chamomile and green tea, eggplant skins, apple skins (different colors), paprika (another common pepper spice), carrot, dill seeds, purple grape juice, strawberries, blackberries (purple, not black), henna, prickly pear fruit, and edible colorful flowers such as rose, dandelion, amaranth, orchid, African violets, begonia, lavender, common snapdragon, various daisies, etc. (see a list of edible flowers for use in cake decoration). Some flowers dye very well, but are poisonous, such as iris. Grass likely wouldn’t hurt you, and we all know it stains green. These look amazing. I am so going to try it out this Easter. Are there any ways to make the natural dyes more intense so you don’t have to dye them so long? Can’t you save those hard boiled eggs and eventually they will dry up inside and you can keep them as long as they get no holes or cracks? Wow! 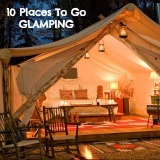 I love this DIY project of yours.I would love to share this post on my blog and also the 6th picture. I will provide a link to your blog and give due credit to your photograph. Please let me know. Thanks. Wow! I love this post. Thanks for sharing, Debs. Btw, I would like to share this post in my blog and the 6th photo as well. 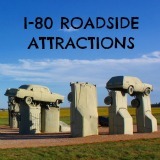 Please let me know if its ok with you.I will provide a link to your blog. Thank you very much. Hi Steve, Great list. thanks for sharing. HI DEB FROM DEB! VERRRRYYYY COOOOOLLLLL blog you have & the eggs are eggs-sellent! I wonder if some of the things I’ve done w/ fabric would be applicable? I have dyed fabric in the past with elderberries and also froze them to use at a different time(and wrote on pkg. NOT TO EAT, as I wasn’t too sure they were elderberries at the time), also something that really stains things around here – fresh strawberries. For eggs you could experiment with the intensity by keeping the egg in “strawberry mash” for different times. Fresh blueberries – you’ve already used, along w/cranberries-one of the prettiest reds going.I have used – with great success – dandelion greens for dying fabric. I wonder if a “mash” of greens would yield a great egg dye, too? You’d have to pick them this year, freeze & label for next. My poor husband never knows exactly what he’ll find in the freezer in our garage at different times of the year…but I’m fairly good about labeling. One great thing for color is the little pistils from the day lilies we have here in abundance in the summer. 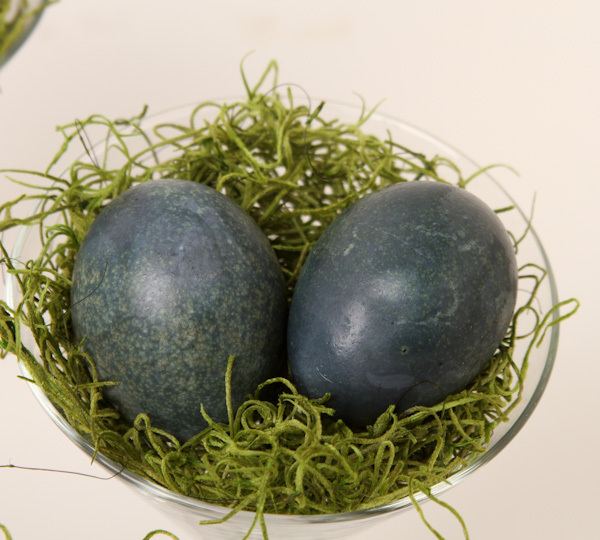 Yep, I used them to dye silk, they worked quite nicely, and wonder if they would freeze well to use for easter eggs??? Also, a neat thing was to use bleach on my dyed fabrics (spray bottle, paint brush – very diluted and VERY WELL VENTILATED outdoors, for only tiny period of time!! !and I’d never use on a hardboiled egg that I was going to peel and eat!). Something else that reacted w/ fabric and again same high level of caution applies to food & personal safety-is dish washer detergent. It’s more caustic than you think! But these methods worked on fabric and I believe the egg shell would be porous enough to try these tricks too. Again, only blown out eggs are the best ones to use if you are keeping the cooked egg out of the fridge for any time over an hour. I know the guidelines say 2 hrs is ok, but why chance it? When dying in the past, I have dyed right in the fridge. You probably have to leave things longer, but it’s worth it. I have used farm fresh eggs (I run a farmers’ market in my town)in the past and they seem to dye the best-someone told me it was due to the calcium being “extra good” and there may be something to that. beautiful egss, to dye using red or yellow onion just use a raw egg , wrap some of the onion skin around the egg then wrap apiece of cloth and secure with elastic or you can put inside stocking then cook to make hard boiled egg.you can also keep these eggs for ever. just keep the eggs out of the fridge and allow the yolk to dehydrate on its own. just be careful to not break the egg. i have many eggs that are 10 or 12 yrs old that i display at easter. have fun creating! Thanks for the great instructions and photos! Your eggs are beautiful! Because I wanted to use what I had on hand, I tried red pepper, curry powder and frozen blueberries. I so appreciate the ease and simplicity of the cold method. Thank you! What if you used apple cider vinegar instead of white? Would it change the colors? @janet. Not sure if apple cider vinegar will change the colors or not. It’s worth giving it a try. I’m thinking some of these same items can be used to dye natural fibers like wool. 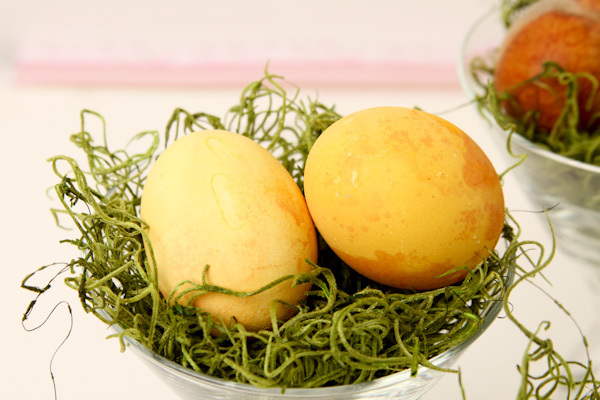 Could the eggs have sat in the natural dyes in the fridge so that the eggs would not spoil? Wow I love the natural look of some of these. We might try this. Wow! You sure did a lot of work, lovely photos and graphics too. I’ll have to try the red cabbage and blueberries, the blue eggs are lovely. The turmeric ones too. I’ve tried beets and unfortunately, unless you squint or look at it through rose-coloured glasses, the colour comes out in various shades of gray, not a hint of red or pink! I think the calcium carbonate in the egg shells reacts differently with natural dyes, which would otherwise colour natural fibres or food quite nicely. I’m still on the hunt for a tried and true natural red or pink dye for eggs. I remember when I was kid boiling eggs with onion skin and tea – 20 years back in one of the Soviet countries. 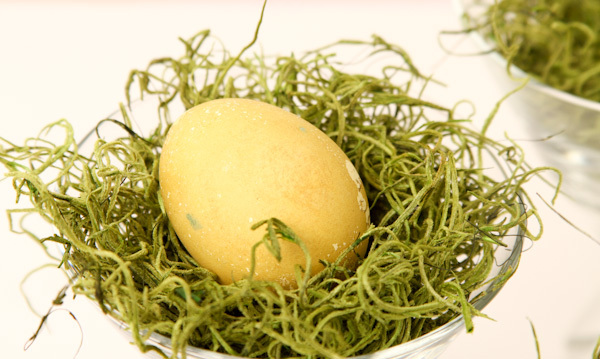 We would also wrap the eggs in a corn leaf – to create random pattern. The best thing is: since it’s all food items, you don’t have to be afraid to actually eat the egg! This inspired me since I hate the chemical food dye and am tired of spending $20 on three small tubes of coloring at Whole Foods. Half the fun was finding stuff I thought would dye the eggs. I used frozen beet stock (I knew I’d have a use for that! ), blueberries, blackberries, raspberries, turmeric and mustard, turmeric and crushed red pepper (going for orange), crushed red pepper and paprika, tea, and coffee. They’re still steeping but so far the beets and coffee are most colored. Beets are magenta, really cool! Very nice!! I tried red and yellow onion, and also beet (hot and cold -both methods). I liked very much the results. Next year I hope I will try even other ingredients, I’m thinking of black cherry juice and grapes. Oh, wow! We usually just paint them with food coloring, but these are so much better! They look more natural and so beautiful! I’m curious as to what I did wrong. The blueberry & blueberry/cranberry eggs turned brown not blue. And the cabbage eggs were only a very light blue. All 3 sitting overnight. I was quite disappointed in the colors after following the directions above.